An unregulated toxic contaminant has been detected in 20 drinking water supplies in North Carolina, including those serving Greensboro, Dunn and Wilmington. Fluorinated chemicals, also known as PFCs or PFAS, have been found in public drinking water supplies serving 15 million Americans in 27 states, according to a joint study between the Environmental Working Group and the Social Science Environmental Health Research Institute at Northeastern University. PFCs are commonly found in coatings and products that resist heat, oil, stains, grease and water, according to the Centers for Disease Control and Prevention. This can include clothing, furniture, adhesives and heat-resistant, non-stick cooking surfaces. They don’t break down in the environment, but rather they accumulate in wildlife and in the human body. The EPA reports that these chemicals cause reproductive and developmental, liver and kidney, and immunological effects and tumors in laboratory animals. In humans, researchers have found exposure is linked to increased cholesterol levels and possibly low infant birth weights, a weakened immune system, cancer and thyroid hormone disruption. 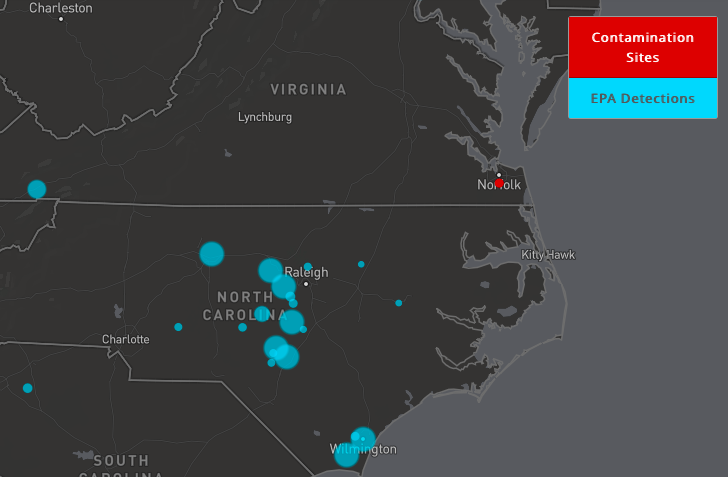 Of the 20 effected water systems in North Carolina, as shown on the EWG map, Greensboro reported the highest maximum level, 90 parts per trillion, with an average of 24 ppt over eight samples. In Dunn, four samples produced an average level of 12 ppt, with a maximum of 30 ppt. Wilmington reported an average of 13 ppt in three of its four samples. The contamination level peaked at 27 ppt. The findings are based on data from the EPA and publicly documented cases of PFC pollution from manufacturing plants, military air bases, civilian airports and firefighter training sites. Of the 47 places where the source of contamination is known or suspected, EWG says, 21 are military bases, 20 are industrial facilities and seven are firefighter training sites. The chemicals are no longer manufactured in the United States, but are still used globally. The EPA has not established a safe threshold in drinking water for these compounds because they are considered “emerging,” and still being studied. Moreover, the EPA data on the extent of PFCs in drinking water is limited. The agency’s testing of unregulated chemicals covers only water systems serving more than 10,000 people, and is only mandated to test 30 chemicals per three-year testing period. The EPA has not added a new drinking water contaminant to the Safe Drinking Water Act in 25 years. Freestone County Texas has rust colored water half the time and WAY over chlorinated the other half. We also have Sanderson Farms chicken houses that just went up all over the county that have caused our streets to flood….hmmm.This is going on all over the country and we have no way to control it other than putting in a well. We are at the mercy of the water companies and the chemicals we are being exposed to.